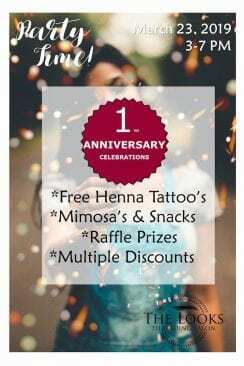 The Looks Threading Salon, located at the intersection of Copper Hill and Seco Canyon, is celebrating its 1-year anniversary on Saturday, March 23, from 3:00 p.m. – 7:00 p.m.
And for the first time ever, the salon will be offering an incredible discount on Memberships. The salon even features a small kids area to keep your little ones entertained while you enjoy the glass of Mimosa! Date – Saturday, March 23, 3:00 p.m. – 7:00 p.m. Location – The Looks Threading Salon, 27916 Seco Canyon Rd #202, Santa Clarita, 91350.